The Mara Autonomous District Council (Board of Mara Literature) Rules, 2015. Note: Ary liata PDF link he click la asia viapa ta na mo thei aw. to provide for the constitution of a Board of Mara Literature to preserve, develop and promote Mara Literature. Whereas under clause (a) of sub–paragraph (7) of paragraph 2 of the Sixth Schedule to the Constitution of India, the District Council is empowered to make rules regulating the formation of Boards and their procedure and conduct of their business. and commencement. District Council (Board of Mara Literature) Rules, 2015.
of their publication in the Official Gazette. under sub–rule (1) of rule 3 of these Rules. (ii) “Chairman” means the Chairman of the Board. Schedule to the Constitution of India. Committee of the Mara Autonomous District Council. 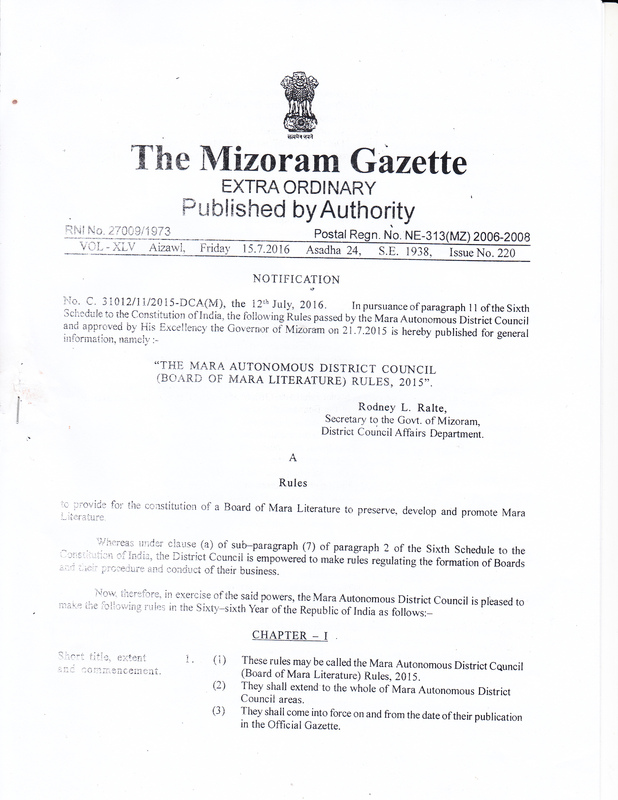 (vi)	“Official Gazette” means the Mizoram Gazette. (vii) “Secretary” means the Secretary of the Board. Secretary and other seven members. shall be a Secretary of the Board. (4) The other 9 (nine) members having knowledge and experience in Mara Literature shall be appointed by the Chairman. Among the members, one member shall be from an officer of Education Department of the District Council. (6) The Vice Chairman, Assistant Secretary and other Members of the Board shall hold office for a term of three years from the date of the first meeting of the Board. year or shorten as it may deem necessary. its acceptance by the Chairman. (iii)	who remains absent for three consecutive meetings without the leave of the Board. provided by sub–rule (2) of this rule. of the member in whose place he is nominated. Board. on the advice of the Chairman. shall preside over the meeting of the Board. (5) Meeting minutes shall be recorded by the Secretary. the Chairman may think fit. before the date of the meeting. (d)	to preserve and promote Mara Novels, Mara Comics, Mara Idioms & Phrases, Poems, Prose and Books, etc. (f)	to organize Seminar, Workshop, Essay Competition and Symposium for the development and upliftment of Mara Literature. Constitution of 10. (1) The Board may constitute Expert Committee or such Expert Committee. other Committee as it may deem necessary. by the Chairman on the basis of the subject matter. (ii)	submit its findings to the Board. honorarium as may be determined by the Board. and three other members to be appointed by the Chairman. (3) The Secretary of the Board shall be the ex–officio Editor–in–Chief. (4) The term of the Editorial Board shall be two years from the date of constitution which may be shortened or extended by the Board if it thinks necessary. the improvement and upliftment of Mara Literature. (3) If a book written is found publishable for the improvement and learning of Mara Literature by the Board, the same may be published. (4) The expenditure incurred for publication of the books shall be borne by the Board. (2) The agreement regarding the publication of the book shall be made on the basis of the mutual understanding of the author and the Board. (1)	to be published contravenes any law of the land or not? (2)	contains uniformity and consistency or not? (3)	contains in itself readability or not? (4)	is saleable or not? (5)	contains correctness, accuracy, etc. in itself? (6)	contains correct wordings and correct grammar in itself? (7)	contains correct punctuation or not? (8)	The Expert Committee appointed under these Rules shall have the power to correct or change the contents of any book to be published. (9)	The author’s arrangement of wordings and intention in the book should be preserved as far as practicable. progress and improvement of Mara Literature. (f)	In consultation with the Chairman and Secretary, the Executive Committee may appoint five (5) co–opted members, as may deem necessary. (3)	General Body meeting shall propose and suggest for the improvement of the Board. (4)	Suggestions regarding Mara Literature may be discussed in the General Body Meeting. (5)	General Body meeting may be held once in a year preferably in the month of February or October. Department of the District Council. Motto and 17. (1) The Motto of the Board shall be “Literature is the Emblem. foundation of the Land and the Nation”. (2) The emblem of the Board shall be of the following. There shall be two circular lines and on upwards side of the two circular lines, “Board of Mara Literature” shall be inscribed and on downwards side of the two circular lines the Motto of the Board, “Literature is the foundation of the Land and the Nation” shall be inscribed. And at the centre of the two circular lines, there shall be an open book and palm writing with a pen showing the identity of Literature. And below the circular lines, there shall be a ribbon like structure divided into three lines and at the left side, the word, “Estd.” S hall be inscribed and at the right side the year “1983” shall be inscribed and in the middle of it “MADC: Siaha” shall be inscribed. The Mara Autonomous District Council has not framed any rules for the progress and development of the Mara literature since its inception. Now, it is felt necessary that a Board to look into the improvement and development of Mara Literature is needed to be constituted. Therefore, it is proposed that rules be made for the constitution of Board of Mara Literature.